I was looking for some tangy rice to go with garlic shrimp for a special lunch, and I wanted it to double as a new jar mix recipe, so my kitchen became the testing ground for this new gift in a jar recipe. I enjoyed this combination very much, and there was enough left over to warm up in the microwave next day, to go with grilled chicken breasts for supper. I hope you enjoy it too! 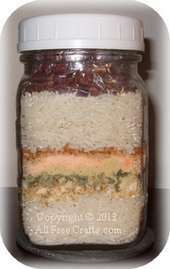 Layer ingredients in a one pint (two cup) jar, in the order given above, except for the dried fruit, gently packing down each addition, and adding spices around the edge of the jar so that they are more easily seen. Using a funnel may help you distribute each layer evenly. Package the chopped, dried cranberries (or your combination of dried fruit) in a small plastic bag. Add the bag to the top of the jar, pressing it down against the top layer of rice to prevent ingredients from moving around. Screw on the jar lid and fasten tightly. Decorate the jar as desired and attach a tag of recipe instructions. You can write out the directions below, or attach our Printable Tag for Cranberry Orange Rice. If you use another combination of dried fruit, print the alternative Printable Tag for Tangy Fruit Rice. Cut out the tag you wish to use and fold it into quarters, so that the recipe instructions appear on the inside. Punch a hole in the top left corner, thread with raffia or ribbon, and tie to your jar mix. Remove the bag of dried fruit from the top of the jar and set aside. Add 2½ cups of cold water, 1 tablespoon of butter, and remaining contents of the jar to a medium saucepan and bring to a boil over high heat. Reduce heat, cover saucepan, and simmer for 10 minutes. Remove pan from heat, stir in cranberries or dried fruit mixture, replace cover, and let sit for 5 or 6 minutes, or until rice is tender. Stir and serve. Not my fb account, but I do like your gifts in a jar. Thank you for sharing.